Installing stained glass into a home’s design can create a magical presence. However, that is not normally an option for most people. So instead, we can place beautiful stained-glass pieces or tiles in the kitchen or bathroom to create that beautiful look. Hirsch Glass Tiles are the markets leader in stained-glass tile and mosaic manufacturing. The Hirsch Glass Tile Allure Collection, Blended Ice Collection, Braided Jewel Tile Collection, Earth and Art Tile Collection, Earth and Art Offset Collection, and the Frames Tile Collection are original in design. They offer some beautiful earth tones in these collections that add a neutral design to any residential or commercial space. The glass and mosaic tiles can be used as back splashes, wall tiles, or decorative wall art in the office, kitchen, bath, or lobby. Hirsch Glass was established in 1992 and has focused on designing the best quality stained glass products and tiles. Hirsch Glass has designed their architectural tiles based on their background in Tiffany lamps and stained-glass windows. Art Glass tiles, mosaics, and panels are produced at the company’s high capacity manufacturing facility in Pulandian, China. Plumbtile carries the largest selection of Hirsch Glass tiles. There is a design for everyone’s style. Some of the collections Plumbtile carries are Hirsch Glass Tile Signature Collection, Hirsch Glass Tile Silhouette Collection, Hirsch Glass Tile Sparkle Collection, Hirsch Glass – Vogue and so many more. 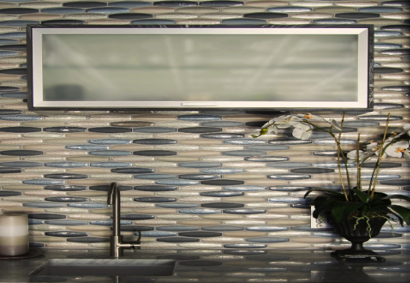 Plumbtile carries 20 different collections of Hirsch glass tiles. Each collection has specific styles and colors. Such as Hirsch Glass Tile Allure Collection, Hirsch Glass Tile Blended Ice Collection, Hirsch Glass Braided JewelStone Tile Collection and Hirsch Glass Earth and Art Tile Collection. These tiles are beautifully crafted earthy tones. If you are going for a milder look of stained glass you can choose a tile within this collection. Plumbtile has a collection of tiles for everyone. If you have any questions you can contact one of our specialists who are waiting to assist you.